Ok, this post definitely needs some words! Was that getting a ticket for walking his ostrich? lol! Where was this? Escondido? Nicole, you have to explain! Too hilarious! It surpasses the pig I have seen being walked on a leash along Santa Monica's beach. Nicole, that's what I thought by looking at the man's uniform, I can read polizia municipale on his back. Troppo divertente! That is hilarious. 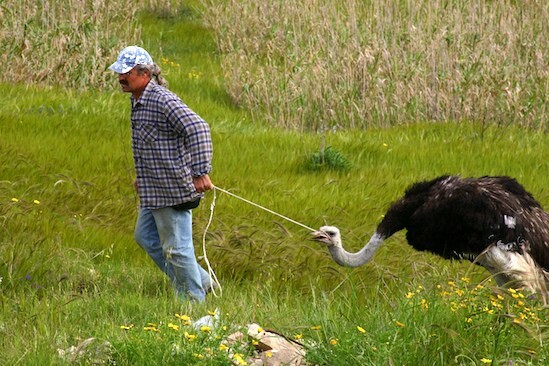 Who takes their pet ostrich for a walk?? Totally crazy. Looking for large free-range eggs? 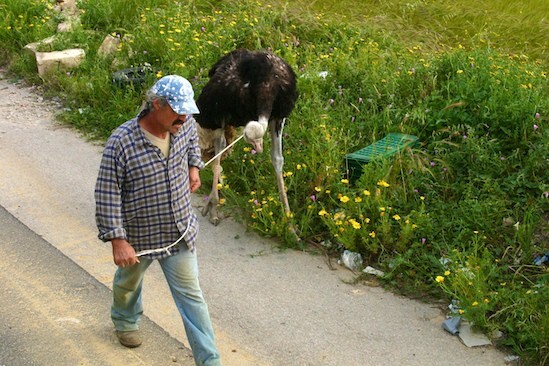 Hey - there's nothing wrong at all with a man and his bird going for a stroll. Even if said bird does not seem particularly willing. 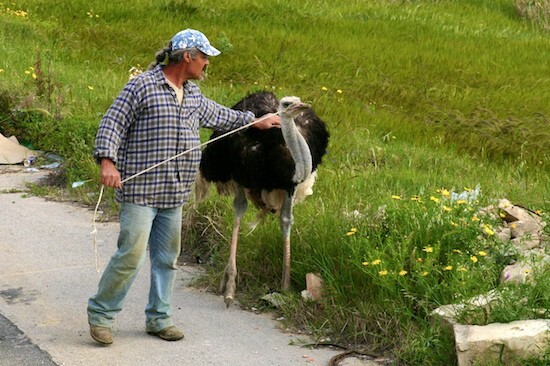 The ostrich looks a bit unwilling about being lead around by a leash but very content in seeing his owner receive a ticket for pulling him around! 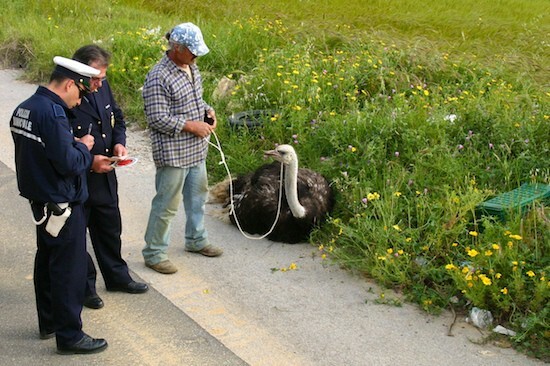 What I want to know is if they are arresting the person or the ostrich at the end? You need to have a "CAPTION THIS PHOTO" contest on one of these!! To funny... God I love living in Sicily!! I was scoping out Polizzi Generosa today and mentioned to my traveling bud that there is not one outing I've taken in Sicily where I have not Laughed out Loud at least once during the ride.. some of the things you see here!! Oh WOW. This is absolutely hysterical. Even more so since you didn't post text with it...ha! I love the last photo where the ostrich is just lying down, like, "What? I'm relaxing!" This is too funny. Ostriches also look a lot like the emus they have in Australia, and I once tried to feed a few at a petting zoo, but seriously? They tried to eat my hand. Not okay. Ergo, this photo also made me slightly nervous;) I'm digging this wordless wednesday thing. Who started it? That's great, thanks for sharing! so funny.